This column is intended to be a complement to the previous article titled “Lessons Learned from Street People.”. 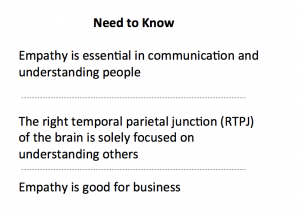 I suppose it is (more than) a bit controversial to have a business article focus on something like empathy – I can’t help but wonder how many of my topics fall into this category? Regular readers will recognize I have already written extensively on this before in various contexts. Clearly, this is a vast, complicated (but per the sister article relevant) topic so while I have a couple comments today – there will likely be more to come. While I intend to focus on the topic of empathy (and as usual draw on research of others and my reading and experience) I would like to start with a story that not only involved empathy but also a topic that goes hand in hand and also reflects a perpetual challenge in business (and life) – defining yourself (and others) by limitations. On a recent cross country junket, I was on a flight delayed out of Dallas. Needless to say there was a boarding area full of disgruntled people – with one exception. There was a young girl confined to a wheelchair who had put on her headset presumably with ballet music as she was whirling a la a pirouette in her chair. I was fascinated and lucky enough to make eye contact and exchange smiles. One of the most unbelievable parts of the experience was how many people were ignoring her. Finally, they were boarding the flight and as I stood in line they announced ‘people needing special assistance’ should board. At that point her mother was pushing the chair – the little girl turned and with the saddest eyes and most depressed body language asked her mother if she was going on first because she was handicapped. She looked at the agent who, of course, had done nothing to even acknowledge her. Within a flash it was a different child! And in a flash so many of the things I have learned about neuroscience and psychology were confirmed. I share this story because I believe it illustrates the power of empathy – I am confident she believed me because we had established a rapport – two people who had shared an experience. I share it also because the metamorphosis in that little girl illustrated (confirmed) to me a lot happens when we define ourselves (or let others) by our limitations. Is this experience unique to a child in a wheelchair? I would argue (supported by several previous articles, as well as work by Simon Sinek and Frans de Waal) – no! The point is, this is illustrative of human interactions. This is indicative of the common denominator of all these articles – people. Let’s move on to a more scientific/academic plane – I call your attention to a recent TED Talk by Rebecca Saxe titled “How We Read Each Other’s Mind”. 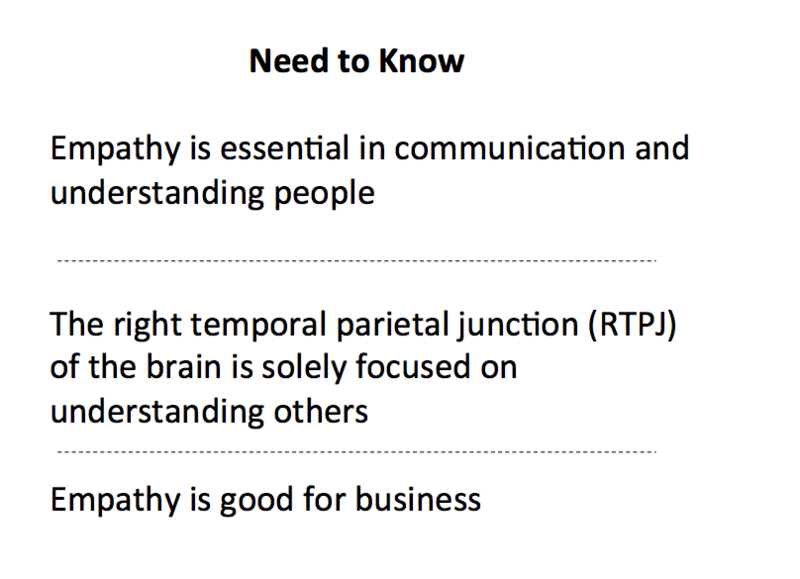 To me the most salient point here is there is a specific region of the brain (Right temporal parietal junction (RTPJ) that is solely focused on understanding others and thinking about others’ thoughts. All this starts around five years old when we realize other people can have different beliefs. You would think by the time you are old enough to be a business builder or a business manager you would have mastered these skills! It has been said children learn to read hearts before minds! For my money the two definitive works on empathy and primates (most business people are primates although there are times….) are “The Age of Empathy” and “Good Natured” (1996!) by Frans de Waal. You know, this reflects more than good science – it is good business! Agree? Disagree? Let me know your thoughts and personal experiences. And let’s remember to be empathetic to each other in the comments.